The supraspinatus muscle is one of the most common trouble makers when it comes to shoulder pain. It is a member of the rotator cuff group. People that often stress this muscle a lot are painters, rock climbers, piano and violin players. To cut it short, people that have to work with elevated arms for prolonged periods of time. Of course other people may overload this muscle to. So if you have pain in your shoulder, make sure to check it. If your supraspinatus contains trigger points, you might feel pain right at these spots. But you also might feel an ache in more distant, seemingly unrelated areas of your body. 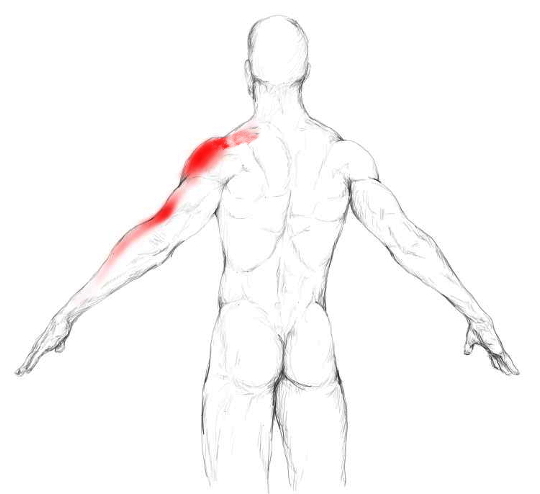 The most common area of pain which comes along with trigger points in this muscle is the side of your shoulder. Beside that, pain can radiate down the whole side of your arm – especially to your elbow –. This way it can contribute to the following aches. Click on the corresponding link to learn how to get yourself out of pain. The intensity of the red colour in the picture indicates how common it is to feel pain in the marked spots. 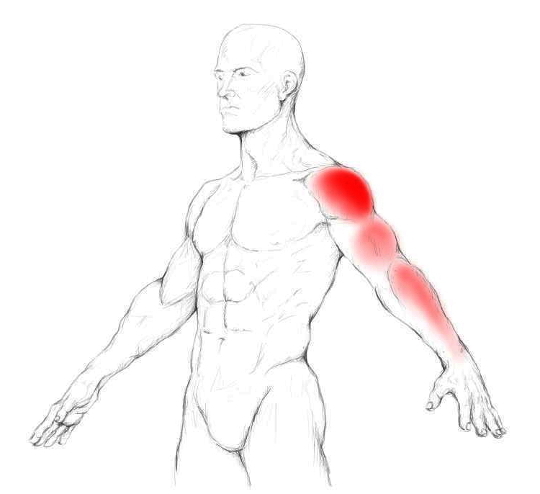 The darker the red, the likelier it is to experience an ache in the respective area when your supraspinatus contains trigger points. Stress this muscle too much and it may give you pain while doing some of the following movements. Please remember that those are just examples and do not display a complete list. In general, you may have problems with all movements that require lifting your arm at and above shoulder level. In more dramatic cases it may be even difficult to elevate your arm at all. Here are some common movements and activities where you have to lift your arm. The muscle attaches planar on the shoulder blade just above your spine of scapula. From there it connects to the tuberculum majus at your humerus – the outer side of your upper arm –. The Xs in the picture below display common areas where tender and trigger points in this muscle can develop. Its best known function is the abduction of your arm. Furthermore it helps to keep your shoulder stabilized when moving it. I want to give you an example of how this muscle stabilizes your shoulder. When you carry a shopping bag, its weight is pulling on your shoulder. Here, it prevents your upper arm from sliding downwards too much. Thus while carrying a bag it is very active and acts as a counterforce of the bag. This scenario of course, applies every time objects are pulling on your arm. Now please imagine how much it has to work in order to stabilize your shoulders if you are doing deadlifts for example or pull anything heavy off the ground. Another common scenario would be your dog at a leash or your child pulling on your arm and thus stressing this muscle. Here again, the muscle prevents your shoulder from pulling apart. Trigger points in the supraspinatus usually develop due to active overload. Good examples might be carrying a heavy bag or executing dead lifts in the gym. In both scenarios the weight is pulling on your arms. The supraspinatus has to work hard, so your humerus (upper arm bone) does not get pulled out of the shoulder socket. But also all activities where you have to work with the arms above your head are stressfull, as they activate the muscle permanetely. Furthermore, injuries like a rupture of the supraspinatus tendon can activate trigger points, which might persist long after the injury itself has healed. Locating and feeling your supraspinatus is pretty easy. Just put your fingers slightly above your spine of scapula. Try not to go too high as you will then reach the middle part of your trapezius. You want to put your fingers between your trapezius and your spine of scapula. Now slowly start to raise your arm to the side. While doing this movement you should feel it thickening under your fingers. If you cannot feel it right away, do not stress. Just repeat the slow raising of your arm a couple of times while searching for the right spot. I recommend massing this muscle the Trigger Fairy. This is the easiest and safest way to access it and to exert pressure. You also can use a massage ball but it is a little bit more difficult and not that convenient for massage, still effective and doable. But you will never be able to rellay get through the tissue on the muscle. I do not recommend massaging this muscle with your fingers of the opposite hand. Yes, you can reach the muscle very good and you also can apply pressure BUT you have to exert all the force from your fingers, your arm and your shoulder. It is possible that you do something good to one of your shoulders while stressing too much the just mentioned parts. Still, if you want to do it, form your hands like a shovel and apply the principles shown below. With the Trigger Fairy, you can access the muscle without straining your hands. Yes, they are brilliant massage tools, but also very delicate ones. Only use them when necessary. Place the Trigger Fairy on the muscle. Search for tender points by pulling the handle downward and forward. To massage the muscle, use circular motions or the pressure-motion technique. Find a tender spot and then execute circular motions with the handle. This way you massage each tender spot. Lift and lower your shoulder or execute circular shoulder movements. Also experiment with the position of the Fairy.